All the torrential rains and tornadoes in the Southeast have brought some pleasantly cool weather. I love that I can wear jeans right now and not start sweating as soon as I walk outside. Here's my I'm ready for fall to start look. Are you as ready as I am? Love Love Love it! Do you pick out your outfit the night before? If you teach at night, do you wear these outfits there or where during the day? I really like that necklace from Target. Wow, i love that jacket! and those shoes are great! and your bunny is cute as always. Wendy - I don't usually pick out an entire outfit the night before, but sometimes I decided which shoes, for example, I want to wear the next day. I wear these outfits during the day and to the dance studio, but I usually change into sweatpants once I get there. I love the jacket. Very original. It is a fantastic color on you. 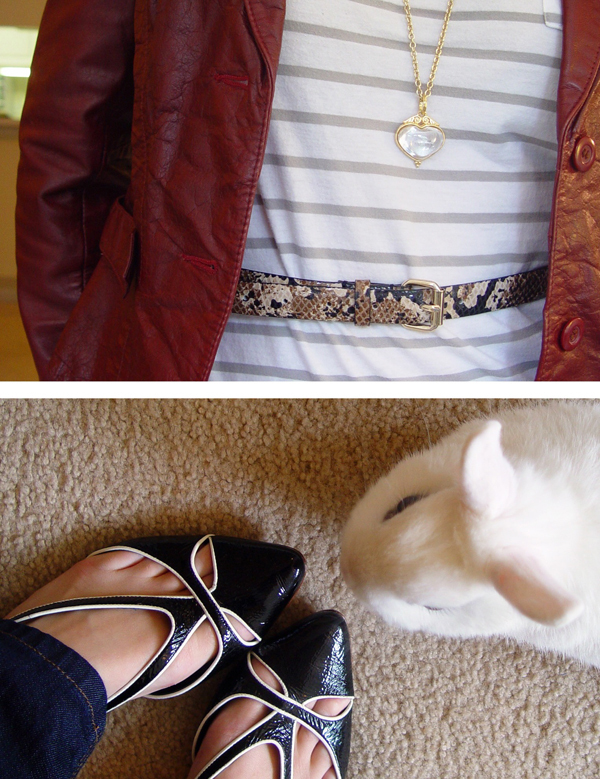 I never get tired of seeing your bunny :) Love the rich red color of your jacket! Thanks Katherine - I really like it, too! Great leather jacket! Thanks for your comment-following you now!